If you feel depressed because you can't leave. If you've left and gone back. 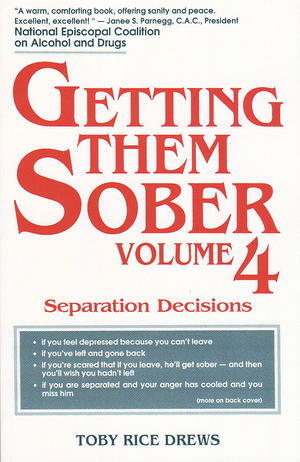 If you're scared that if you leave, he'll get sober - and then you'll wish you hadn't left. If you are separated and your anger has cooled and you miss him. Did any of the above sound like someone you know? If so, than read this book. You will also find a special section by David Evans, Esq., Chair of the Alcoholism and Drug Law Reform Committee of the American Bar Association. He answers your legal questions about divorce, protection of children, and court-ordered evaluations and interventions. "Toby Rice Drews has done it again! With the magic of her story-telling, she has produced a work of profound significance and help for millions. Her wisdom sheds revealing light on the problems of every family member. This book is of immense value."